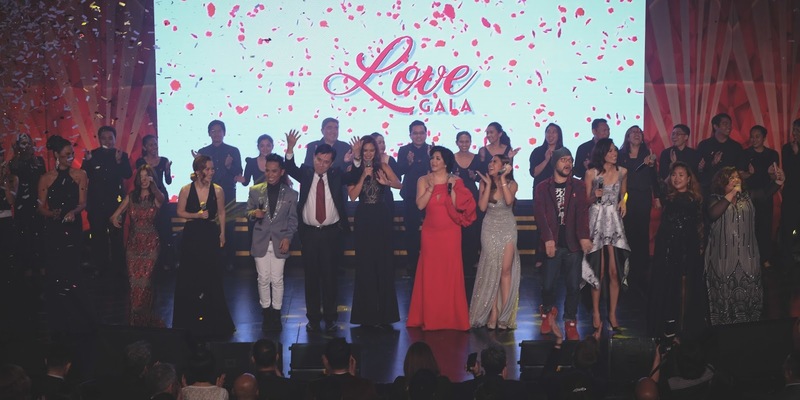 More than five hundred people - including the US Ambassador to the Philippines, the Miss Universe 2015, top Filipino artists and fashion designers, dozens of government officials, and advocates across the country - attended the inaugural Love Gala on December 1 at the BGC Arts Center to commemorate World AIDS Day. Love Gala is the first charity and awards event for HIV-AIDS awareness in the Philippines, and part of the proceeds from tickets sales and event-day donations will go to HIV-AIDS non-profits for their life-saving initiatives. Aside from helping fund worthy organizations, Love Gala attendees witnessed powerful performances, a stunning fashion show, a sneak peek of groundbreaking HIV initiatives and the unveiling of the 10 winners of the first-ever Ripple Awards. The US Ambassador to the Philippines Sung Kim showed his support and reiterated the call to unite in the fight against the rising epidemic. According to the latest data from the Department of Health, around 31 incidences of HIV infection are observed every day in the Philippines, making it one of the fastest-growing in Asia Pacific. The event also graced the presence of Miss Universe 2015 Pia Alonzo Wurtzbach, who launched her first HIV 101 educational video at the Love Gala and called on more people to make HIV testing a part of their health and wellness routine. She is concurrently the Love Gala Ambassador and UNAIDS Goodwill Ambassador for Asia and the Pacific, and has been using her global popularity to shine a spotlight on the advocacy. "Let us work together to normalize HIV testing, so that it’s viewed just like a regular medical check up. Because knowing our own HIV status is the first step in our battle to end AIDS," said Wurtzbach during the presentation of the HIV 101 video, which is part of her broader PIA, or Progressive Information Awareness project for raising awareness on HIV- and AIDS-related issues. "This gala has shown me that there are so many people here who are confidently beautiful with a heart," she added. "Let this night strengthen our bond and commitment to battling HIV and AIDS in the Philippines, Asia, and—why not?—the Universe." LoveYourself also launched a preview of #SafeSpacesPH, a condom distribution project that seeks to establish “safe spaces” where individuals can avail free condoms without fear of judgment or ridicule, and where they can also express themselves in an affirming environment. The Love Gala also dedicated the night to honor the first-ever Ripple Awards winners, 10 brave individuals who have made a significant impact in spreading HIV-AIDS awareness, stopping the spread of the virus, and helping to fight the stigma suffered by their communities. The 10 Ripple Awards 2017 winners include a Philippine senator, a veteran health official, medical and media practitioners, a transgender philanthropist, people living with HIV and community advocates, and were honored for their outstanding efforts and initiatives. The 2017 Ripple Awards winners are: Faustine Luell ‘Paji’ Tupas Angeles, Sherwin Baniqued, M.A. Buendia, Ana Theresia “Risa” Hontiveros-Baraquel, Jebsen Rederri Go Gamido, Enrique Tayag Katerina ‘Doc Kate’ Leyritana, Elena Felix, Roberto Figuracion, Angelina ‘Angie’ Mead King. “The HIV epidemic can be won through greater awareness and education, and these Ripple Awards winners have used their voices and influence to spread the right messages to the people who need to hear them,” said Ronivin Pagtakhan, executive director of LoveYourself, one of the member organizations of the Love Gala organizing committee, and one of the judges of the Ripple Awards. “Action is nothing without compassion, and this rings true in the HIV-AIDS advocacy. We see these winners have set the motion to bring positive, inclusive and systemic change in the communities they serve. Some of them have even risen from their own struggles to do good for others, which is all the more inspiring,” he added. A star-studded lineup of Filipino artists, fashion designers and beauty queens also showcased their creative talents during the Love Gala. Asia’s Songbird Regine Velasquez-Alcasid led the popular and phenomenal artists in a night of special performances at the Love Gala charity and awards fundraiser. Aside from Ms. Velasquez-Alcasid, other performers at the Love Gala include international sensation artist Jake Zyrus, Asia's Phoenix Diva Morissette Amon, Hanggang singer Wency Cornejo, and respected theater actor Audie Gemora. Also lending their beautiful voices to the Love Gala are Radha Cuadrado, Shiela Valderrama, Nicole Asensio, Phi Palmos, and Polly Cabrera, while Daloy Dance Company provided a stirring production. Five top Philippine designers also joined creative forces to stage a visually stunning fashion show. Francis Libiran, Cary Santiago, Nat Manilag, Cheetah Rivera and John Herrera selected key pieces from their existing collections or created new ones to be included in the Love Gala fashion show, and part of the proceeds from the sale of the special fashion pieces will go towards HIV-AIDS charity. Aside from Ms. Wurtzbach, two other beautiful queens also lent their beauty and grace to help the cause, with Miss World Philippines 2016 Catriona Gray and Miss Grand International 2016 First Runner-up Nicole Cordoves hosting the program. The Love Gala is a collaboration among private and public institutions and youth-oriented organizations that want their HIV-AIDS advocacy efforts to reach a larger mainstream audience. Love Gala is co-presented by MAC Cosmetics, Okamoto, Shinagawa Lasik and Aesthetics, Premier Wines and Spirits (Wild Turkey Bourbon, Skyy Vodka, Matua Sauvignon Blanc, Cabernet Merlot and Blossom Hill Rose), special thanks to Telus International Philippines, Goya, Teddy Manuel Flowers and Events, Philippine Amusement and Gaming Corporation (PAGCOR) and Unilever-Creamsilk Philippines. Official media partners are Solar Entertainment (2nd Avenue and ETC) and CNN Philippines. Official technology partner is Hornet.